As well as the glorious two Michelin starred restaurant "Chevre d'Or" of Chateau Chevre d'Or, the hotel also has three other but more modest, every day restaurants open all day long that between them that offer light and delicious every day meals. All three share superb views out over the Mediterranean sea. Even though our weather was a tad chilly, we sat on the terrace "Les Remparts" for our lunch. With the incredible view out over Saint-Jean-Cap-Ferrat and beyond, a little wind seemed unimportant in comparison. 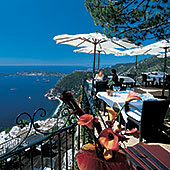 In hot weather, the restaurant, which stretches along the flag-stone terrace outside the bar of the five star hotel Chateau Chevre d'Or, in Eze Village, France, is shaded by a row of market umbrellas or by the pergola adorned with jasmine, ivy and bougainvillea. 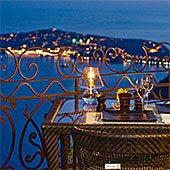 Every table has its own scenic view. Here you can eat breakfast or lunch. Our lunch began for me with Vitello Tomato, served with artichokes, capers and a tomato confit. Peter had the "lite" version of the Eggplant Capunatina served as an antipasto with marinated vegetables & honey lemon vinaigrette. At lunch thin sliced baby vegetables make a garden on top of a baked half eggplant. Since we both can never have to much chicken, the delicious organic chicken breast, rolled and stuffed with a mix of black olives & lemon accompanied by asparagus & roasted pine nuts delighted us. We retired to the Bar and some respite from the cool breeze where Peter indulged himself with a fabulous "Black Intense" 70% chocolate dessert and I, since strawberry season had arrived, relished the light and lovely strawberries with strawberry sponge cake. The next morning, we enjoyed a wonderful breakfast under the umbrellas at "Les Remparts" and were privileged with the company of the "master of les Remparts", Felix the cat. Open at dusk, "Eden" restaurant is adjacent to "Les Remparts" under a covering roof structure that it shares with a lovely pool and its fountain. The seaward sides are open to the elements and the views of the twilight of early evening that deepen to indigo as the sun sets over the Mediterranean sea and night falls. It is a candle lit space with an exotic feel. The soothing sounds of splashing water from the fountain add to the indoor-outdoor ambiance. The food is fusion of Mediterranean and international tastes from around the world. Paradise would find a worthy rival in this extraordinary spot and on a warm summer evening it truly is an "Eden". Set a few terraces down from the other two restaurants, Le Café du Jardin is on the same level as the outdoor pool and has its own bar within steps. Weather permitting, this charming spot is open from spring to autumn. As well as serving drinks at the tables and around the pool, lunch is also served. 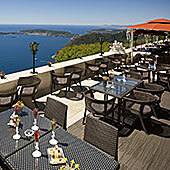 The lovely half-moon shaped terrace has views over the St. Jean Cap Ferrat Peninsula and out to the far horizon. It is the perfect place place to while away the afternoon and I can't think of a more lovely place to be on a warm Mediterranean day.